"Getting the best employees on board and weeding out the worst--without getting slapped with expensive lawsuits--are two of the most crucial and difficult jobs of human resources professionals and general managers. Now there's quick, reliable information on how to do it right. 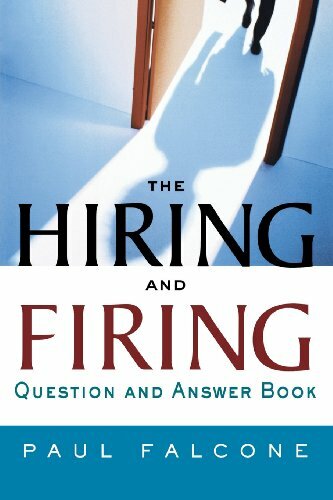 Written by employment expert Paul Falcone, The Hiring and Firing Question and Answer Book contains over 100 commonly asked questions ranging from basic to sophisticated, including: * Does my company need an Affirmative Action plan? * Why should I conduct an exit interview? * How do I find the best Web sites for recruiting employees? * How do I protect my company from negligent hiring claims? * How do I terminate a long-term employee with a history of positive performance evaluations? Each question is followed by a short answer and a longer ""Tell Me More"" section, making the book perfect both as a concise overview and as a practical reference." 'Paul Falcone (Valencia, CA) is Director of Human Resources at Platinum Equity in Beverly Hills, and was previously Director of Employment and Development for Paramount Pictures in Hollywood. He is the author of several best-selling books, including: 96 Great Interview Questions to Ask Before You Hire, 2600 Phrases for Effective Performance Reviews, and 101 Sample Write-Ups for Documenting Employee Performance Problems.